Inside the Spielgaben 9 box, you will find a collection of rings and semi-rings. The rings come in multiple sizes, so you can choose from small, medium, or large rings in a variety of colours. When Spielgaben 8 introduces the line; Spielgaben 9 introduces the curve. 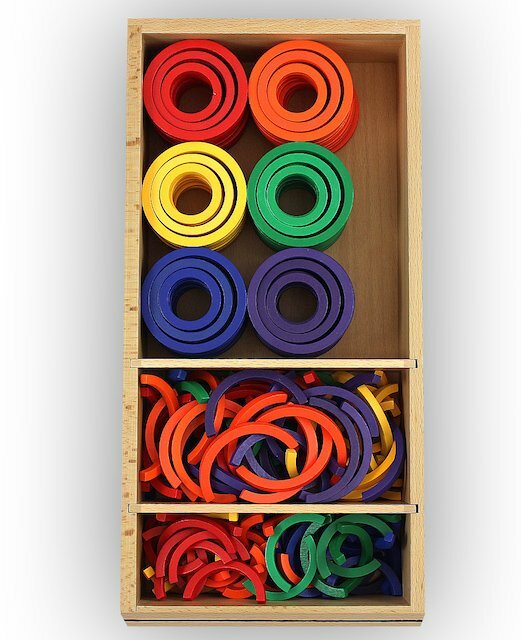 Using this set, a child has the opportunity to explore full circles and semi circles. Until this point, most of the gifts have introduced straight lines. Children are delighted by the beautiful, complex patens they can create with Spielgaben 8. By playing with straight and curved lines, it allows child to explore concepts found in both Euclidean and spherical geometry. As children experiment with the rings and semi-rings, they will notice a different between the patterns created with the sharp sticks and triangular shapes in other parts of the set. Some will find more beauty in the smoother and more fluid designs the circles provide than in the sharper angles and flat sides they create with the sticks and tablets. This will help add even more dimension to the idea of abstract thinking and children look beyond objects such as wheels, balloons, and clouds, to see how circular shapes can be used to bring other shapes together and provide a center point or axis for objects of varying shapes. Think of a basic gear which is essentially a circle with narrow rounded triangles or sticks coming off it. Children will be able learn to manipulate the shapes in similar ways. When combined with the sticks in Spielgaben 8, children can also use the rings and semi-rings to continue to build their knowledge of written language. They can manipulate the rings, semi-rings, and sticks to make letters with rounded edges, such as B and D. The different sizes will also allow children to begin to represent lowercase letters as well and perhaps even use the sticks and rings to create entire words.